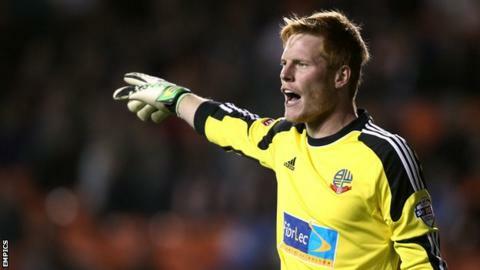 Adam Bogdan says Bolton's strong end to the season is frustrating as it has come too late to fight for promotion. Wanderers, who are 14th in the table, beat Barnsley 1-0 on Saturday to extend their unbeaten run to six games. Hungary international goalkeeper Bogdan told BBC Radio Manchester: "The most important thing is that it has clicked. "Unfortunately it's clicked too late and we can't get to the play-offs, so all we can do is keep this positive run going for as long as we can." Bolton did not win a Championship game until 5 October and another spell of poor form at the turn of the year left manager Dougie Freedman under increasing pressure. But the side have recovered to a safe position in mid-table with seven wins, four draws and one defeat in their past 12 games. Striker Jermaine Beckford, who scored the only goal against the Tykes, shares Bogdan's view that Freedman's side were unlucky to find themselves in such a lowly position. "I don't feel that our performances have been bad," said the 30-year-old. "It's been a little bit of misfortune here and hard luck there. "Now things seem to be falling in the right place at the right time for us and we're getting well-earned victories at last. "We're building for the future and hopefully we can continue this run into the start of next season."